Oh what a glorious day we had yesterday! 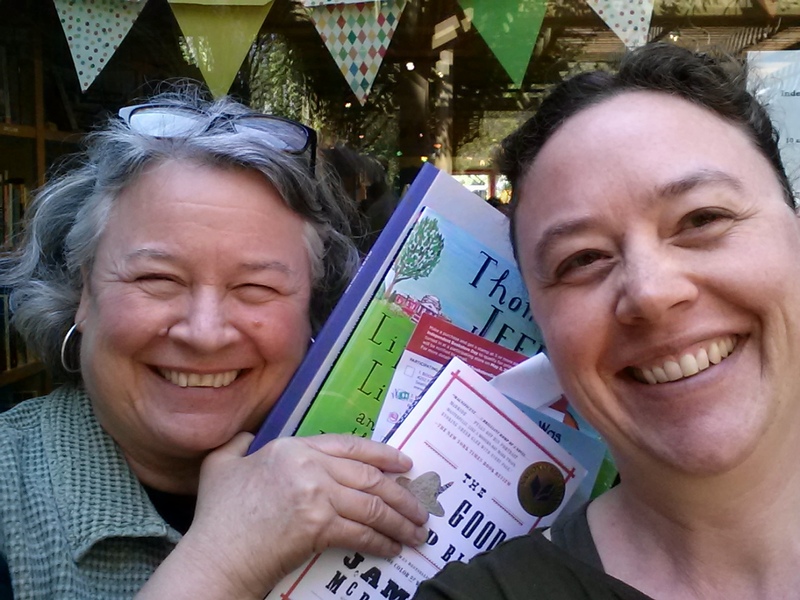 My mother and I met the Seattle Independent Bookstore Day Challenge and went to all 17 participating stores, got a fabulous haul of books, and had a blast all day long. Proof! 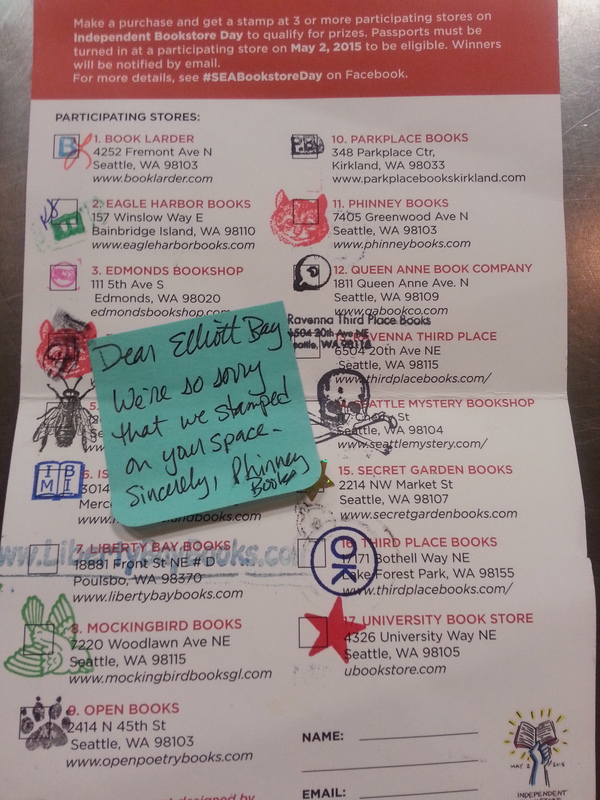 (with a funny note from Phinney Books who momentarily caused PANIC when I thought we’d forgotten to get a stamp from them and that they were already closed. But no, they had extended hours yesterday, and we had only gone one store on so we rushed back – turns out they had stamped it, just in the wrong place. Phew! And hey what’s a Challenge without a little adrenaline rush somewhere. I did have a receipt so probably could have proved our visit with that, but I wanted a complete passport and no chance of a technicality problem! 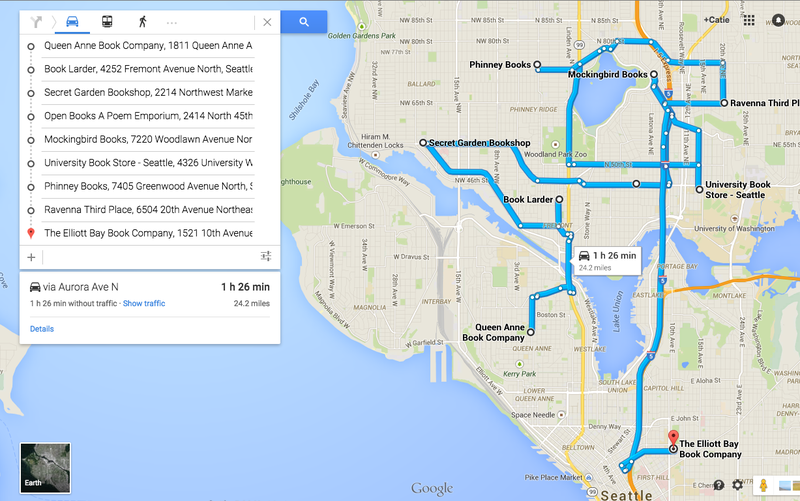 It was a really delightful way to get to know my new* city better. 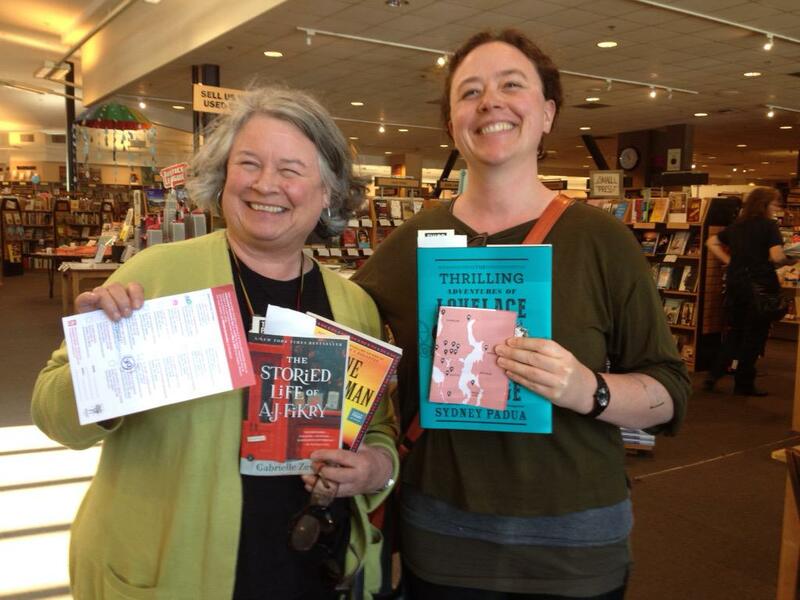 The strength of Seattle’s literary community is quite something*, and there was a lot of palpable excitement in the stores about all the fun that was going on yesterday. 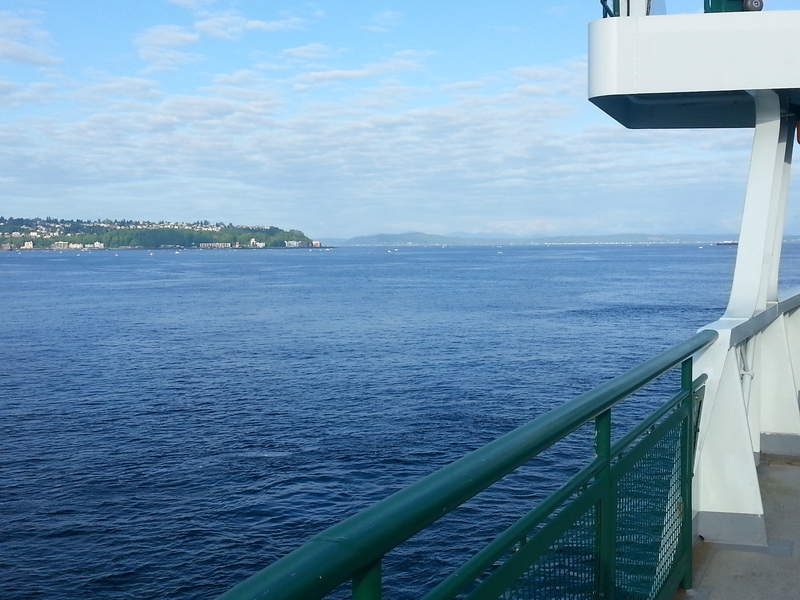 The weather gods shone too, literally—you can’t even believe how glittery the water was. 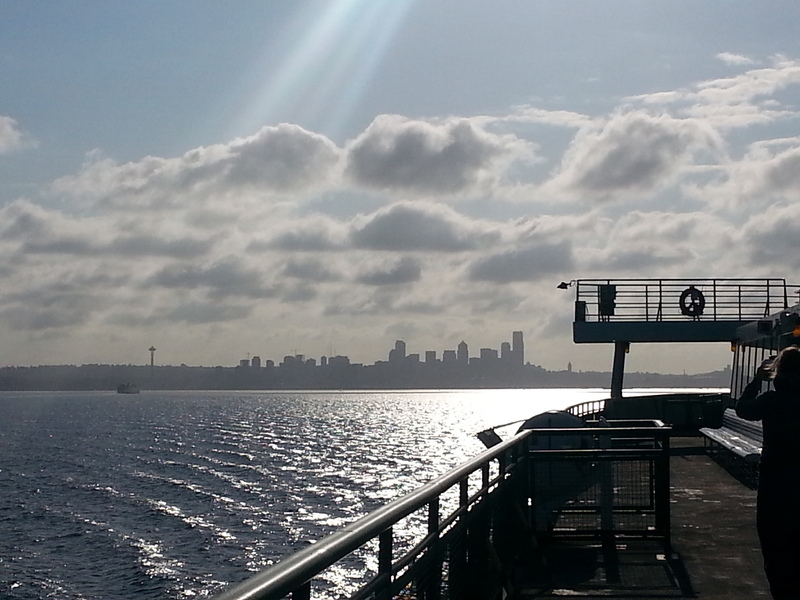 (This is Seattle, so hitting 17 bookstores meant two ferry rides and a floating bridge, plus skirting some lakes.) All of that PLUS books and book people and hanging out with my mother*…just glorious. 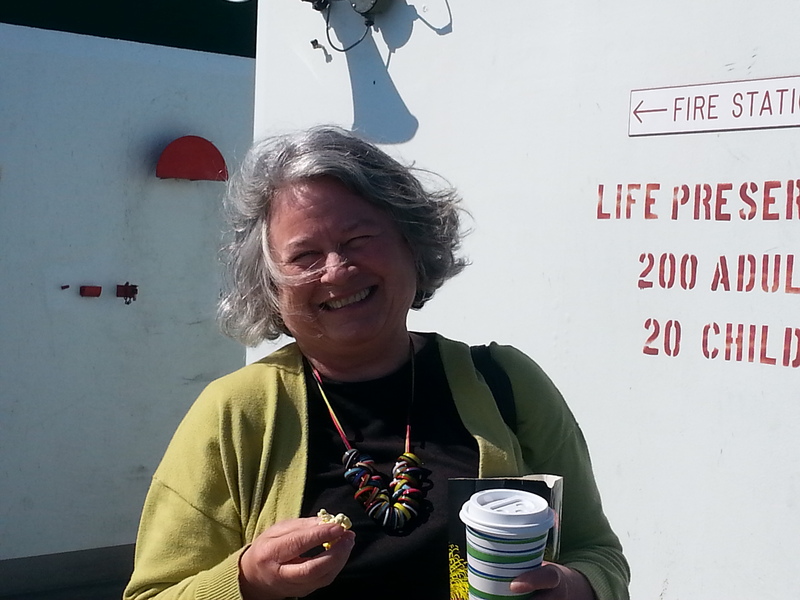 Mom (Marianne Bull) on ferry with popcorn. 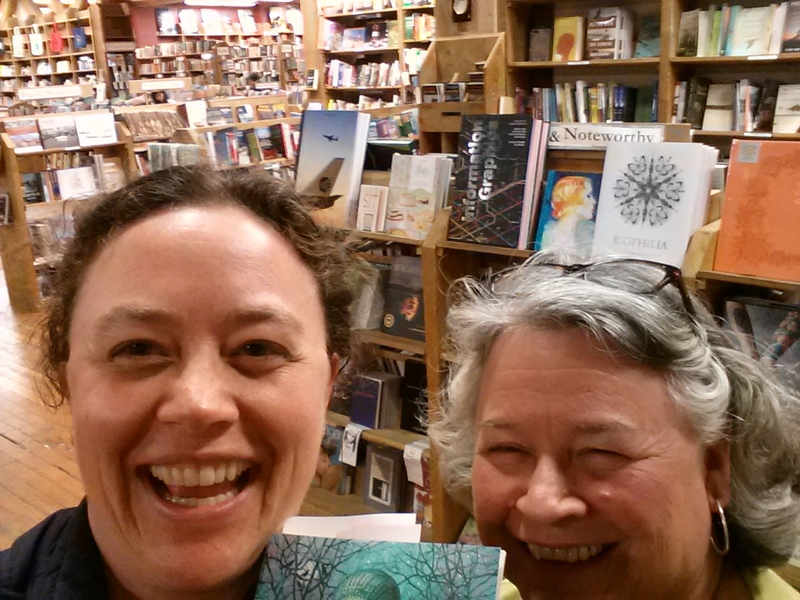 Thanks to my friend Le’a, who came up with a much better route for us than I had*, and to my mother’s mad parallel parking skills* and astounding parking karma*, we actually had time to browse a little at every store and chat with the booksellers, which is of course the best part of any bookstore visit. 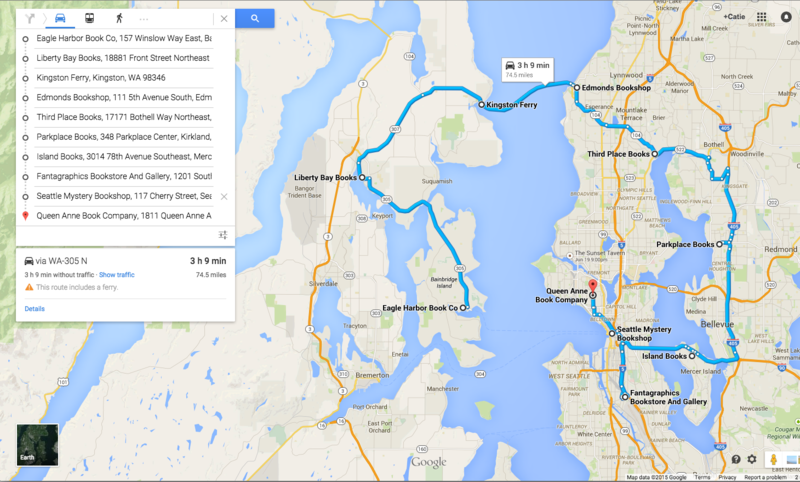 Second leg, within the city proper, ending at Elliott Bay which was open the latest. 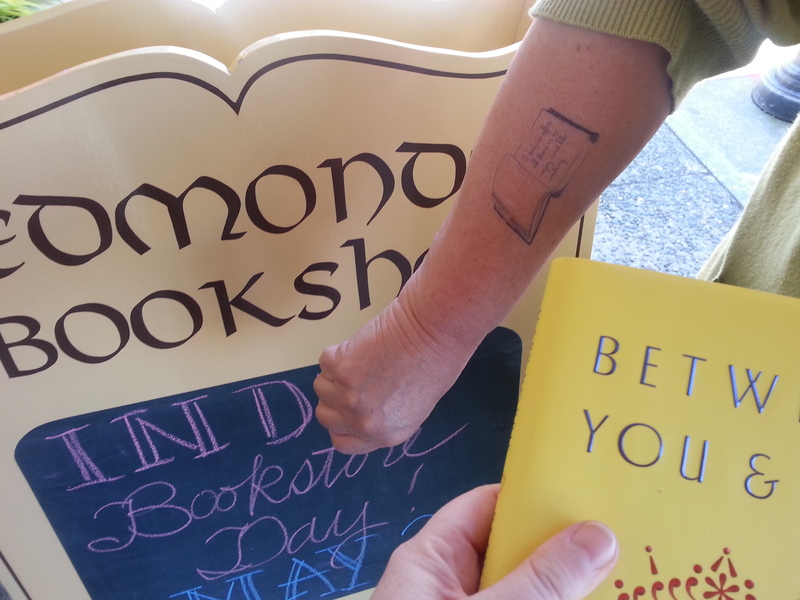 We got matching temporary literary tattoos at Edmonds Bookshop. Third Place Books after spinning their wheel—my mom got a free book and I got a 20% off next purchase coupon. 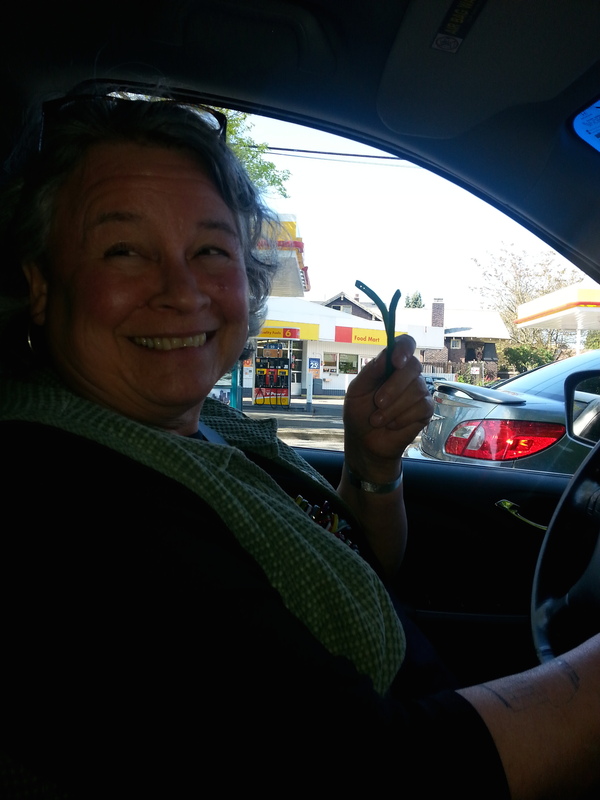 Making sandwiches on my lap in the car between Third Place Books (Lake Forest) and Island Books. 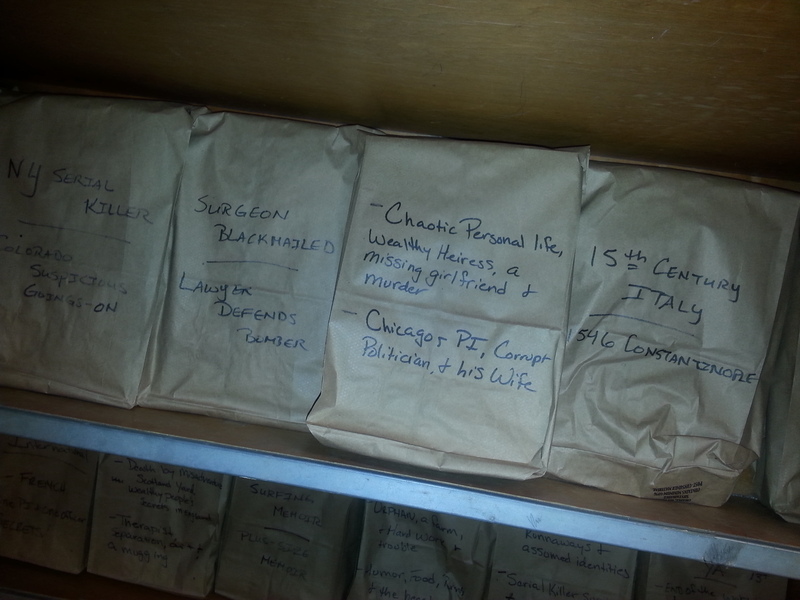 (We brought a cooler of provisions.) Although the day was better than several birthdays in one, it wasn’t either of ours—leftover paper plates from the nephew’s party. 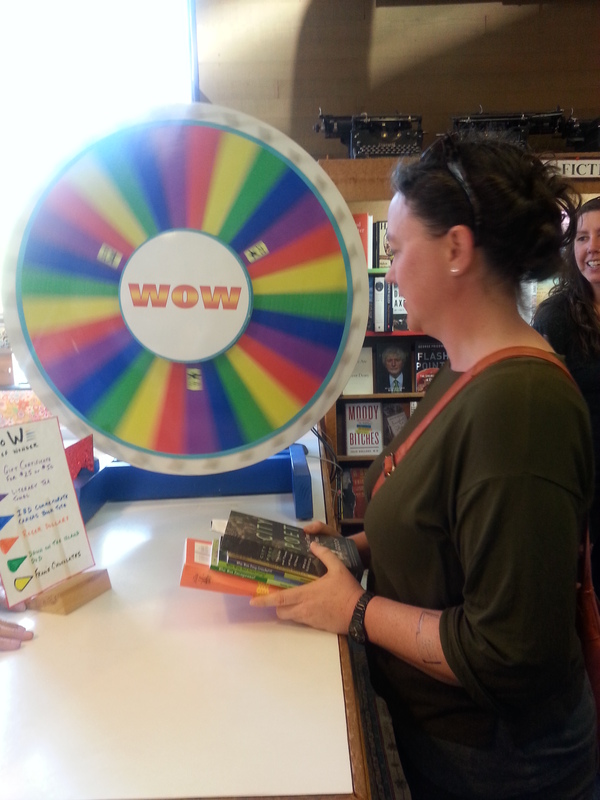 Spinning the wheel at Island Books. 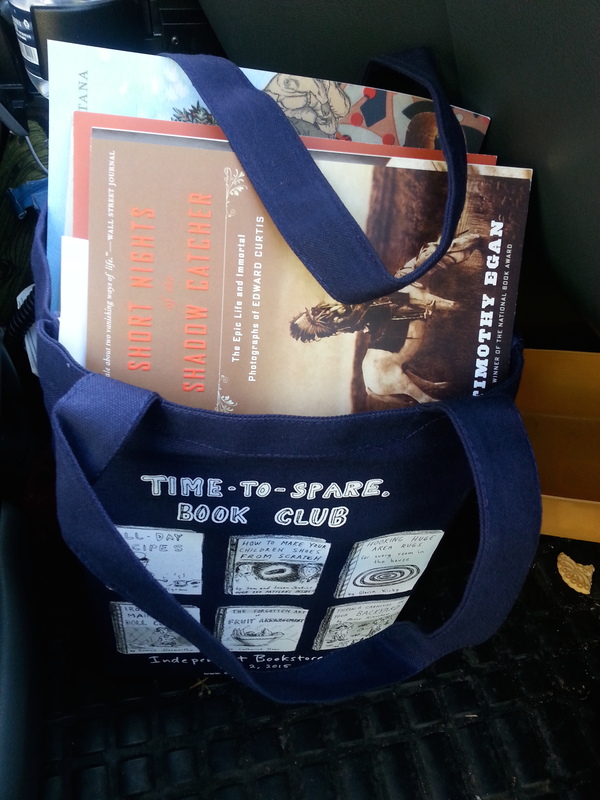 I won a tote bag! Which I totally needed by that point! My “mystery books” choice. 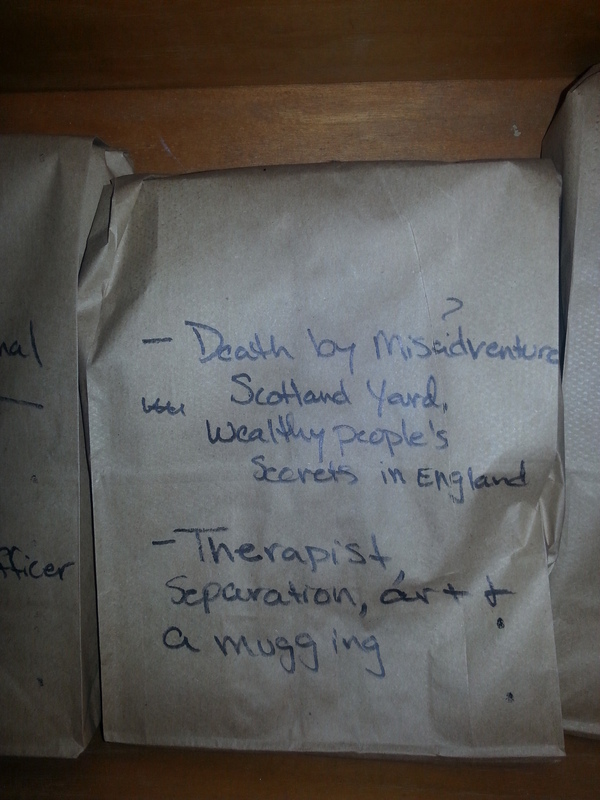 Revealed to be: Enter Pale Death by Barbara Cleverly and Black Valley by Charlotte Williams. 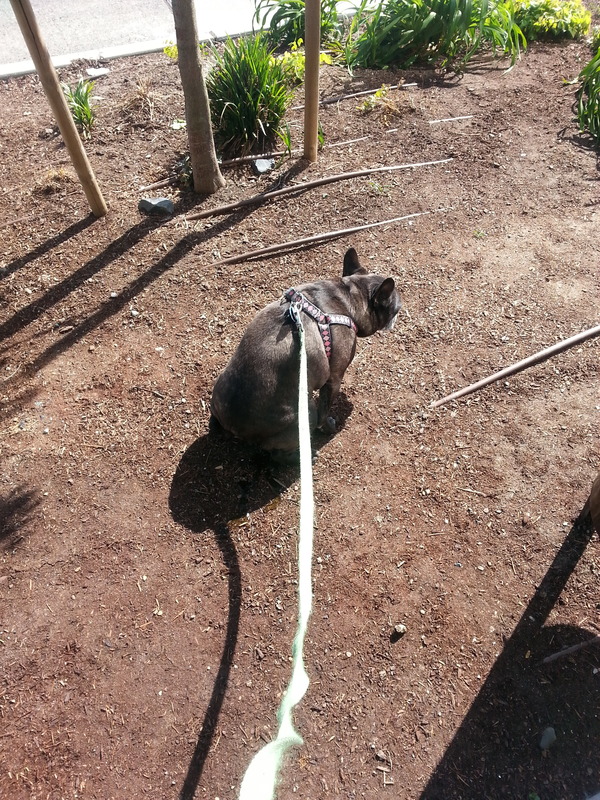 Quick stop home to let the dog out. Home being conveniently located between two of the stores. At Open Books, who just celebrated their 20th anniversary of being the most awesome poetry bookstore ever. 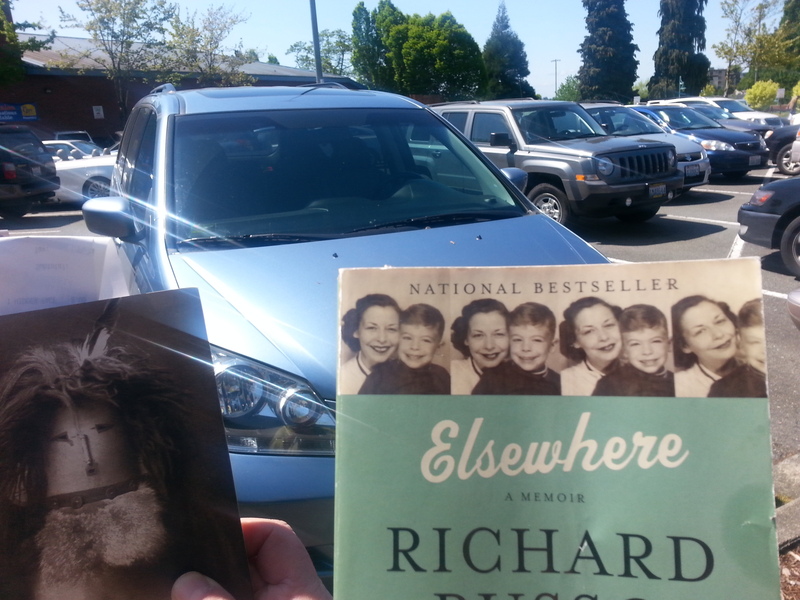 We totally scored with their “free book from the sale table with purchase” special. I got Marianne Boruch’s Grace, Fallen From, and Mom got Jon Loomis’ Vanitas Motel. And the fun of the day will last! A great big stack of new books to read. 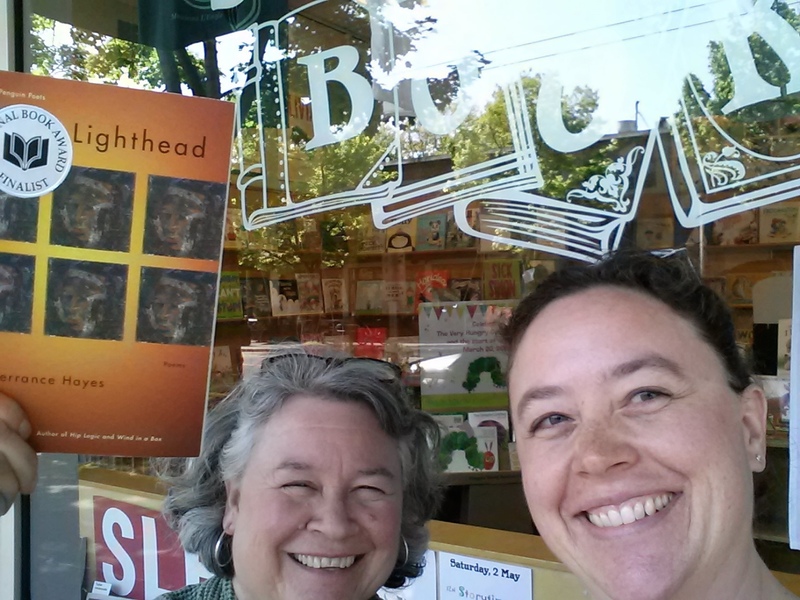 Thanks, again, and continually, Seattle Bookstores! That was awesome. Can’t wait to visit you all again! 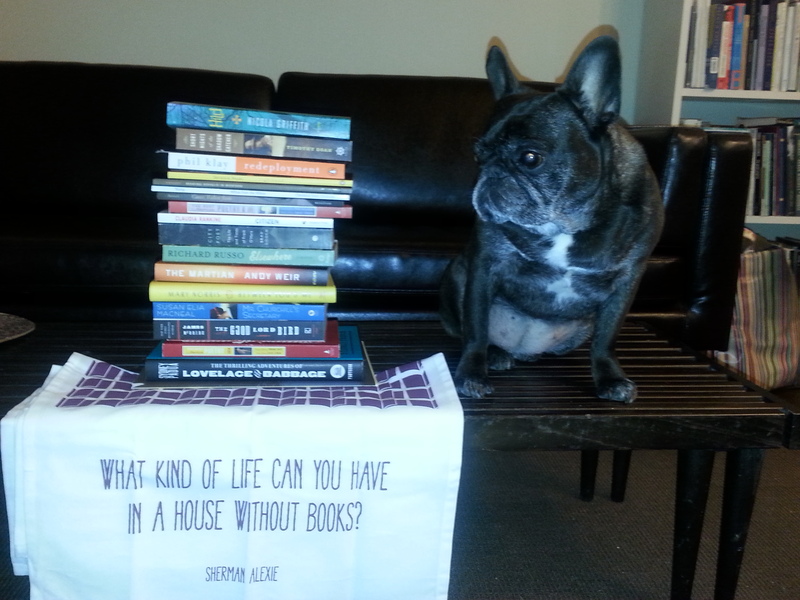 A book person would have understood! We love this! Congratulations on making it to all 17 stores!! Thank you! And thanks to your Twitter feed, which is where I first heard about it all. Congratulations! 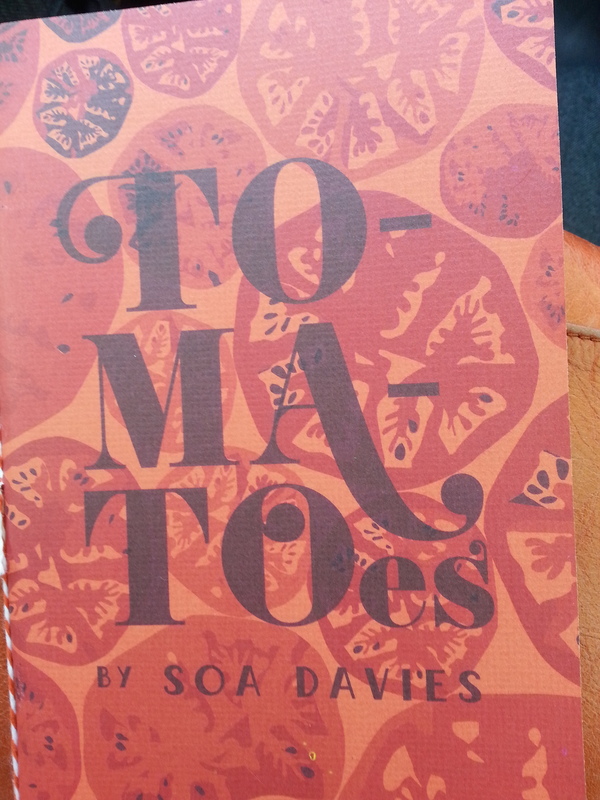 I was on the edge of my seat reading your adventure–I particularly like the making sandwiches in the car bit. I only made it to four stores but my excuse is that we were traveling by bike and bus; we had no plan; and we had scheduled a visit to see baby goats mid-day. Next year I’m modeling myself on you and your mother. Bookstores AND baby goats! Now that’s a good day. 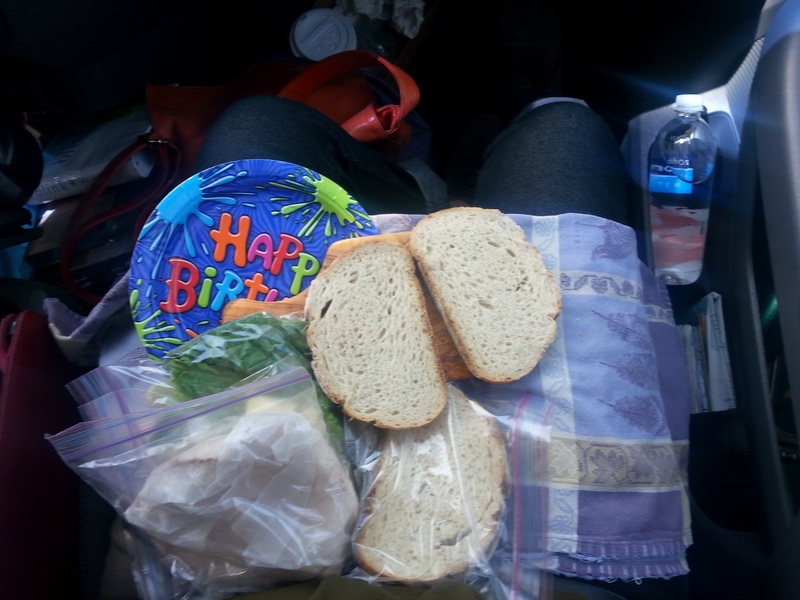 I almost stabbed myself with the knife in the car making the sandwiches. Word to the wise: slice the cheese and the apples ahead of time. See, smart people bring a cooler! That’s what we were saying we’d do next year. 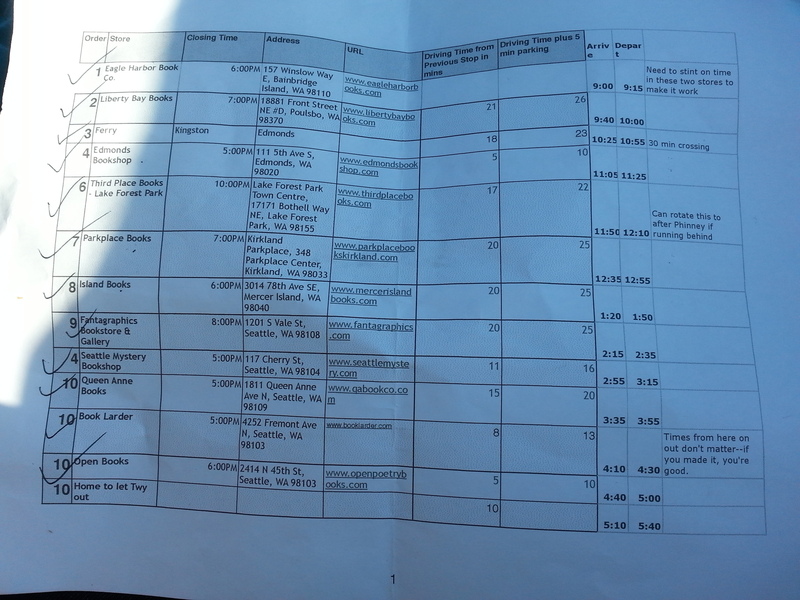 I’m impressed with your spreadsheet too. We also had a blast doing the challenge! Congratulations! I can’t take all the credit for the spreadsheet—I started it and then a friend who is the queen of project management spreadsheets took over and made it awesome. And congrats to you too! 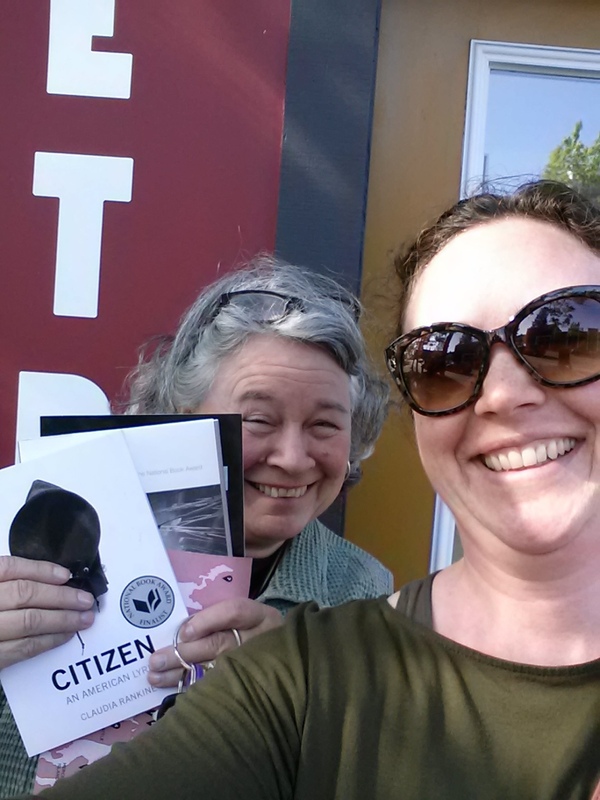 You & your mom did Independent Bookstore Day so right! I love all of this (& especially appreciate the list of first sentences & reasons for acquiring each book at the end); I was smiling for the whole read-through & feeling high levels of vicarious excitement. SF Bay Area stores had a passport this year, too (& prizes at your 3rd, 6th, 9th, etc. stops/stamps). 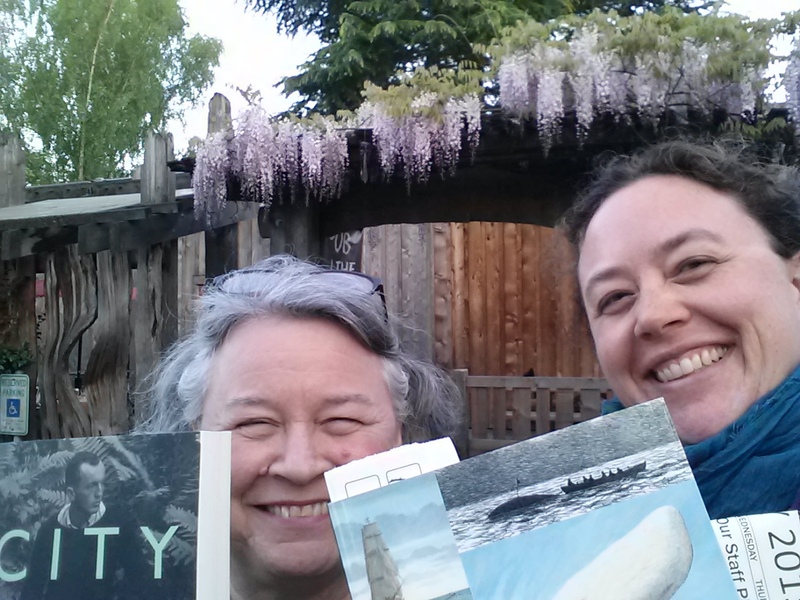 My boyfriend & I laid out a grand plan to get to 9 Oakland & Berkeley, CA bookstores on Saturday, reluctantly drew the line at 6 (dinner & board games with friends beckoned), but were quite proud of our haul. The celebratory atmosphere & lovely booksellers (not to mention all the sweet deals & books) at every stop made it a wonderful day. Thank you! The celebratory atmosphere & booksellers, as you note, was really what made it wonderful. What an awesome adventure, congratulations! I want to try this challenge with my Charles Dickens book group. Would you mind if we steal your route? Looks great! 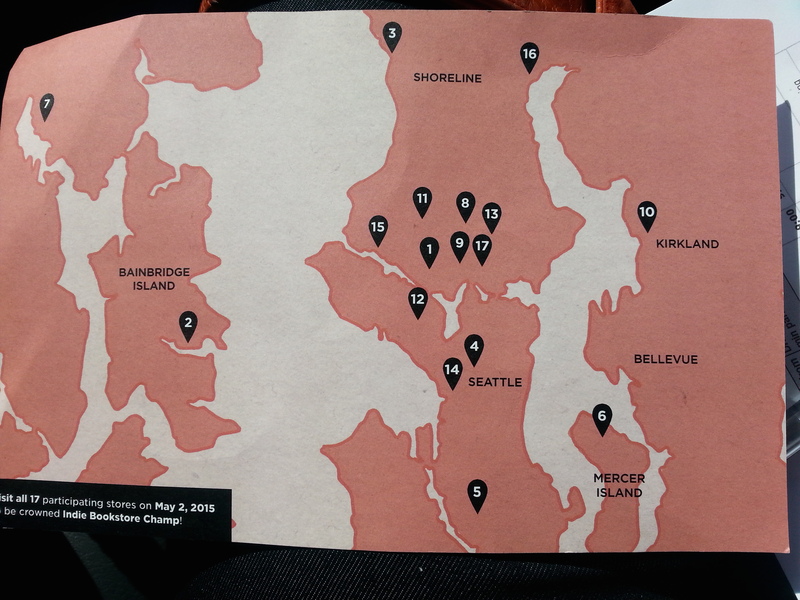 Sure thing — a few different bookstores on the list this year but we’ll be doing the same basic route — start on Bainbridge, then Edmonds, then a swing around the outer ones and then zigzagging all over the central stores, ending up at Elliott Bay because they’re open til 11.